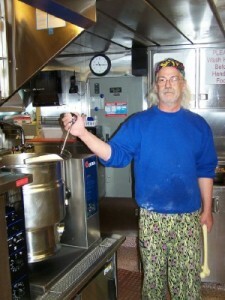 Our sampling of Pollock larvae continues around the clock. It is interesting to see what stations have a lot of Pollock and which ones don’t. From my own observations of the condition of the bongo nets when they are retrieved, I have started to predict if there will be a lot of Pollock or only a little. If the nets are covered in reddish– brown algae, they usually do not have many Pollock, or anything else in them. The nets that are clearer, but still have some red from the copepods, seem to have more Pollock larvae. (I wonder why? )The scientists say that we have found more Pollock larvae than in the past couple of years. (Again, I wonder why?) That’s a good sign for the fishery, though. 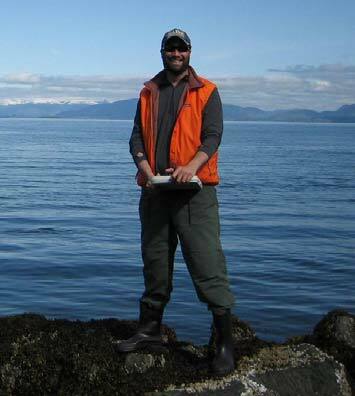 I told you in an earlier blog about how Kevin Bailey is using the data that we collect to create a model that will predict the future population of harvestable Pollock. The other two research projects that are going on have to do with determining how fast the Pollock are growing and how healthy the Pollock larvae are. 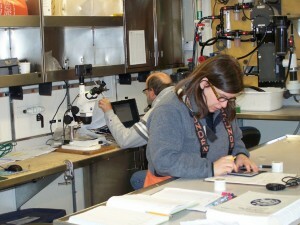 Annette Dougherty, the chief scientist, is studying the otoliths, (small inner ear bones) in the Pollock. The ear bones add a layer of bone each year and create a pattern similar to the growth rings of a tree. The Pollock that are preserved are shipped to her lab where she will look at the otoliths and determine the age of the Pollock to the day. She can then compare that to the size of the Pollock and determine how fast they’re growing. Steve Porter, another scientist on board, is looking at the amount of DNA in the muscle tissue. If the muscle cells are growing and dividing into new cells, there will be a higher amount of DNA in the cells. This data shows how healthy the Pollock larvae are by showing how much their muscle cells are growing. Today’s feature is on engineering. 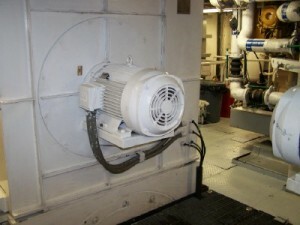 The engineering department on the ship is responsible not just for maintaining the engines of the ship that move us through the water, but also for all the major systems on the ship. They maintain the heating, cooling, electrical, plumbing and sewage systems. 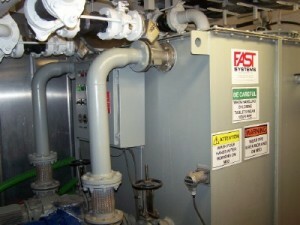 The ship is powered by 4 diesel generators that make the electricity for the ship. The ship is then propelled by the use of electric motors. Using electric motors to turn the propellers decreases the vibrations being transmitted to the propellers and allows for the ship to run much more quietly. This is a good thing for a ship that wants to study fish, or anything else in the water that might be scared off by the noise. 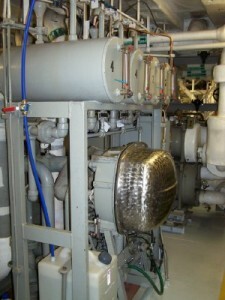 The ship has 2 desalinization units that use heat from the engines to distill the water. The heat makes the water boil leaving the salt behind. It is then condensed back into fresh water. Ships that have engines that produce a lot of heat can use this method which is very energy efficient. 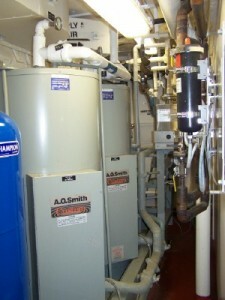 Other ships have to use reverse osmosis (remember that word from the cell unit?) Finally, engineering is responsible for collecting and treating sewage. Maybe in the old days ships would just dump their sewage into the ocean, but not anymore. The toilets are flushed by vacuum action rather than pushed through pipes by water. 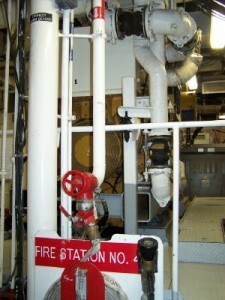 This decreases problems in the pipes that run throughout the ship. The waste water including what goes into the toilets is collected in a storage tank called an active tank. The active tank contains bacteria and yeast that break down the waste. From there, the water is filtered into a “Clean tank.” Here chlorine is added to make the water crystal clear before it is released into the ocean. The system contains one more tank for storage. 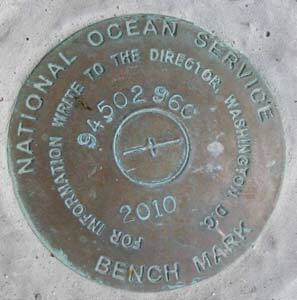 It is used when the ship is within 3 miles of the shore and at dock so water is not released right by the land. Hannah M. – The reason that the procedure was developed for how we sample is to minimize the shrinkage of the fish once they are caught. The scientists are trying to get an accurate measure of the fish so we try to collect and photograph them as quickly as possible. Keeping them cold helps to decrease the amount they shrink. They are preserved so that their DNA and otoliths can be examined back at the NOAA labs in Seattle. The larvae that we are collecting are about 4 weeks old. Elaina – I haven’t spoken with each person about if they get bored on ship or not, but being on a ship is different from being on land. You have your work to do during your shift. Sometimes that can be very repetitive. On your off hours, there is not a lot to do. 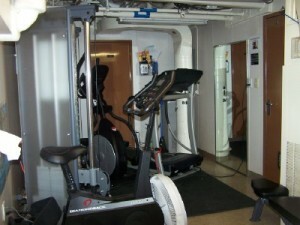 There are however, 2 exercise rooms, you can read or watch a movie or play video games. You can’t, however, just go out somewhere to do something. Lucy – The steward started collecting lunchboxes over 20 years ago. He did it for fun. Eventually he had so many he started to sell them. He sold an underdog lunchbox that he bought for 50 cents for $2500.00. He has sold the entire collection, now. The Oscar Dyson stays close to Alaska. She and her 4 other sister ships were built to be used all over the US. Because of that, she is outfitted with air conditioning although it is seldom used. Her sister ships, that stay in warmer waters, also have de-icers on the windows that they never use. 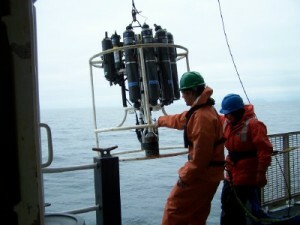 Jasmine – In addition to studying the Pollock fisheries, the Oscar Dyson is also used for ecosystem studies, marine mammal and bird studies. I’m starting to get into a routine on board the ship now. I wake up in time for breakfast at 7 AM. Then I read through your blog entries and catch up on emails. 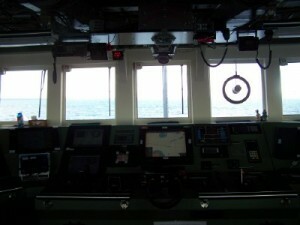 I head up to the bridge before my watch to check out the weather log and talk to the officer on watch. I get to the chemistry lab at 10:00 to start my watch. Lunch is at 11:00, so I may get one station in before lunch. Then we work straight until dinner at 5:00. The bridge tries to time the stations so we have at least 30 minutes to eat. On Monday, we had to eat in shifts because we came on the station right at 5:00. After dinner, we work until 10:00, then Ihit my bunk and its lights out. 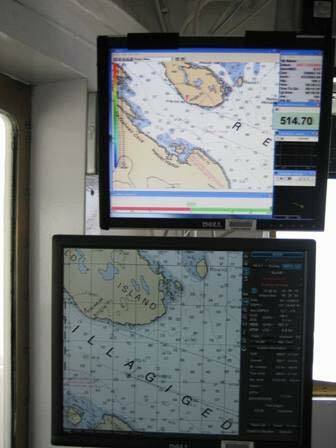 Some of the instruments include 2 radar screens, an electronic navigational chart as well as the traditional paper charts. 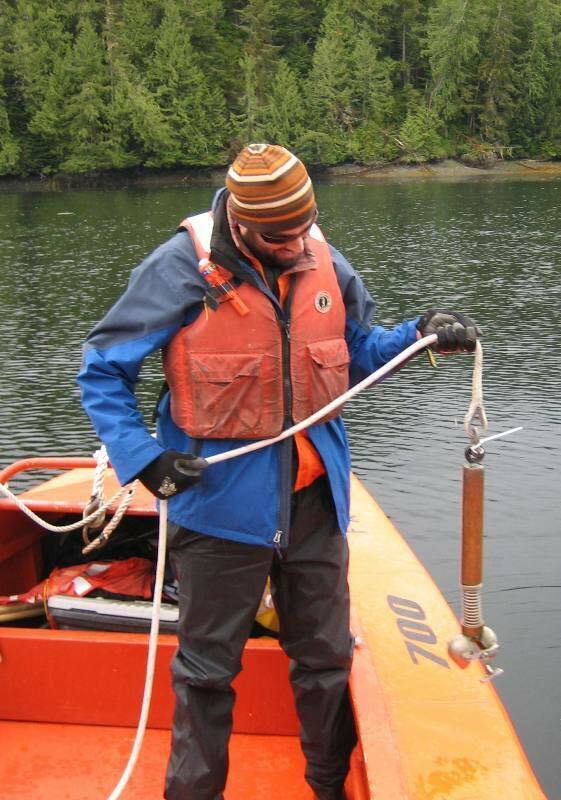 There is an echo sounder to determine depth. 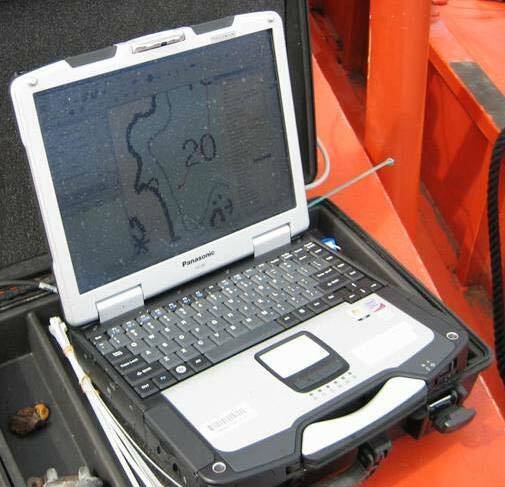 The ship also has 2 GPS receivers to determine latitude and longitude and 2 gyro compasses to determine direction. The ship is also equipped with de-icers in the windows of the bridge. These heat the glass and keep them ice free. Jesse – The CO and the XO inspect the ship to make sure that it is stable. The CO must fill out a stability report before we leave dock. 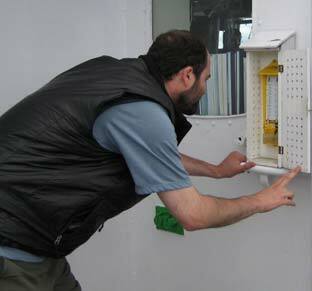 It details where the fuel and cargo are located on board to make sure that the ship is balanced. The XO does a visual inspection of the ship before we leave to make sure that everything is secure. Ashley – Icebergs are not something that this ship would typically encounter. If there were an iceberg, it would show up on radar. The ship would then keep en extra lookout for it and also would give it a wide berth. What the ship typically encounters is flat or pack ice. This also shows up on radar so the ship knows when it’s coming. 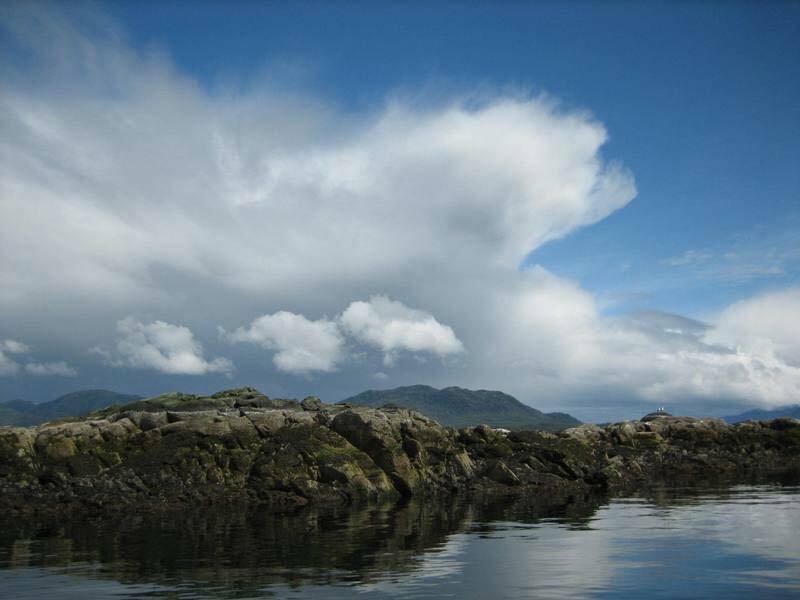 Kellie – The ship ran aground in the Inside Passage in 2007. 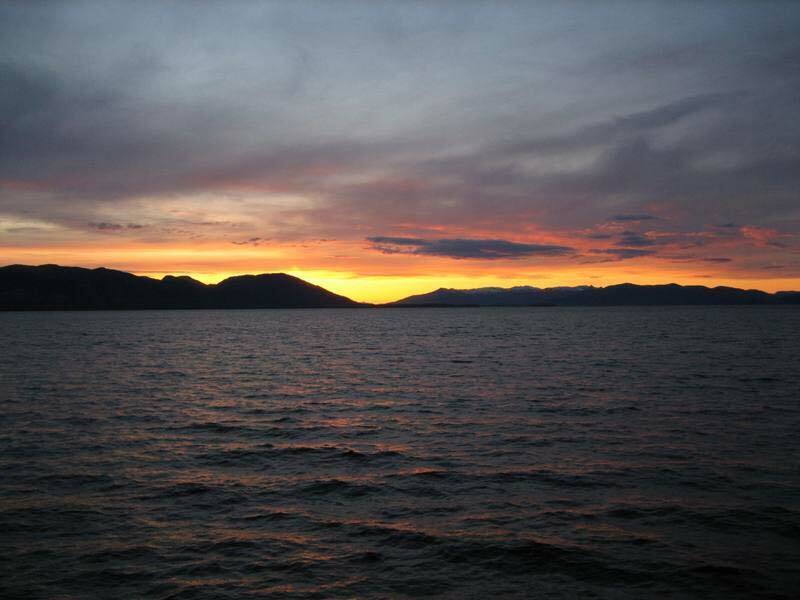 The Inside Passage is in southeast Alaska down by Juneau. The propeller was damaged and had to be rebuilt. Kyle – The Oscar Dyson will make 11 research cruises this year. Since it was launched in 2005, that’s somewhere around 50 cruises so far. One of the most important jobs on a ship is to navigate the ship safely from one point to another. We now have very sophisticated technology to help us navigate, but people have been navigating ships for thousands of years. Research the history of navigation. Choose one civilization and describe how they navigated on the ocean. As always, answer in complete sentences and elaborate. Make sure you include the URL of the website where you found the information. Also, if you have any other questions for me please include. 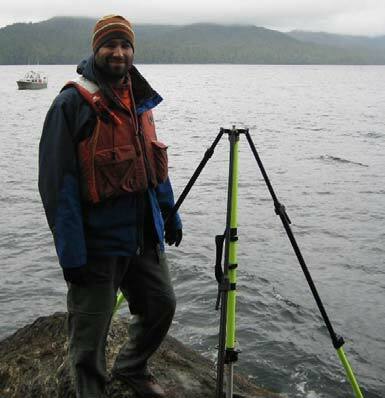 On Monday we were testing one of the multi‐beam sonar transmitters that had not been working properly on the Fairweather, in Hassler Harbor near Ketchikan, AK. In order to verify that the device is working properly the ship went back and forth over an area that has previously been mapped from all different directions. This is called patch testing. Ideally you are looking for no difference in the data from one test to another test. Me,at the helm,driving the Fairweather. Me, practicing using the line throwing device. While on board Monday, we also practiced using a line throwing device. This piece of equipment can be used for ship to ship rescue operations, or to get a line onto a pier if needed, or for other rescue operations. The device is powered by 3000 lbs. of compressed air. Today we only fired a test line, but the real one can travel almost 200 meters. Being prepared and knowing what to do in the case of an emergency is extremely important while out at sea. Not only was I allowed to use the device, but so was anyone else on board who had not learning how to use it properly. 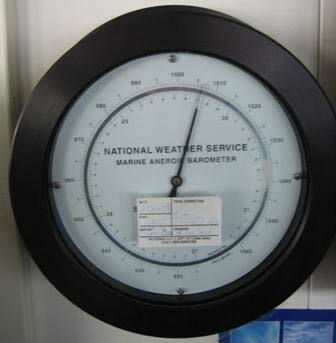 Marine aneroid barometer measures air pressure. Digital anemometer showing wind speed and wind direction. 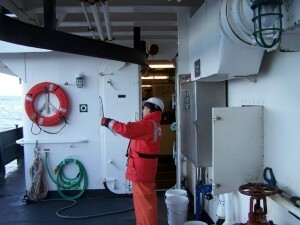 I have also been collecting and recording the weather data from the bridge of the ship. These observations are made every hour. There are many different meteorological instruments on the Fairweather. The atmospheric pressure is recorded using an aneroid barometer. The dry and wet bulb temperature readings were taken off of a sling psychrometer, just outside of the bridge. 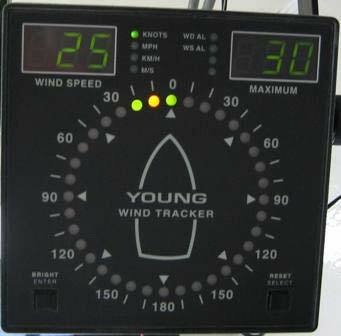 The wind direction and wind speed were taken from a digital anemometer and verified using the vectors of the wind direction and the heading of the ship. 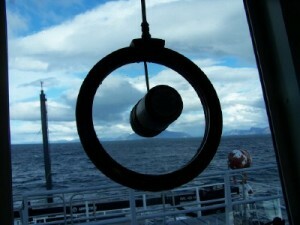 The visibility, wave height and the cloud cover are estimated visually by observing them from the bridge of the ship. 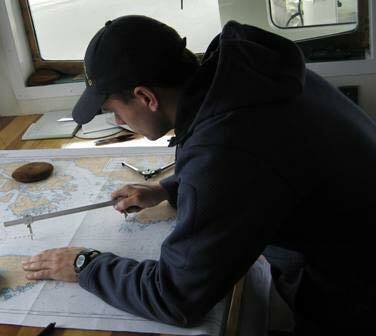 One of the ship’s officers, tracking our plot by hand on the chart. Me taking the temperatures off of a psychrometer outside of the bridge. I was also given the opportunity to man the helm and drive the Fairweather, for about 10 minutes as we headed south towards British Columbia, Canada. 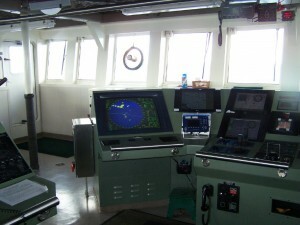 The bridge of the Fairweather has a many different screens, monitors, sensors and gauges. In order to see where we are going there are digital charts, which have our path projected on them. 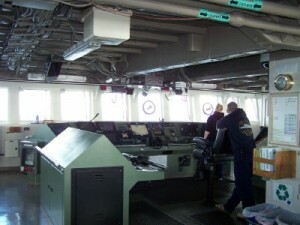 Also, some of the ship’s officers will verify our position along our course by hand. 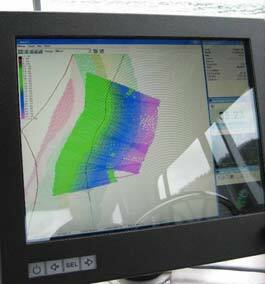 The depth to the bottom is determined by a fathometer, which works by using SONAR, not as complex as the multi‐beam mapping but more similar to a fish finder. In many maritime activities the depth is measured in fathoms. One fathom is approximately 1.8 meters or 6 feet. Knowing where you are and where other vessels are is extremely important. 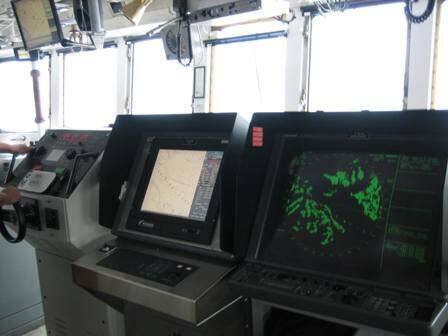 Some of the Fairweather’s navigation systems. 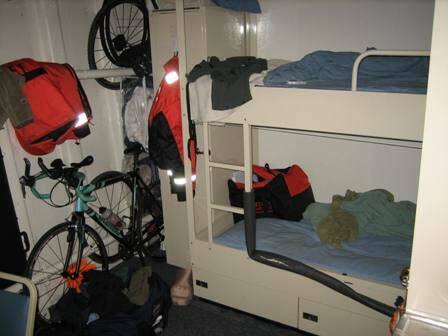 The Fairweather has enough beds to hold a maximum of 58 crew members. 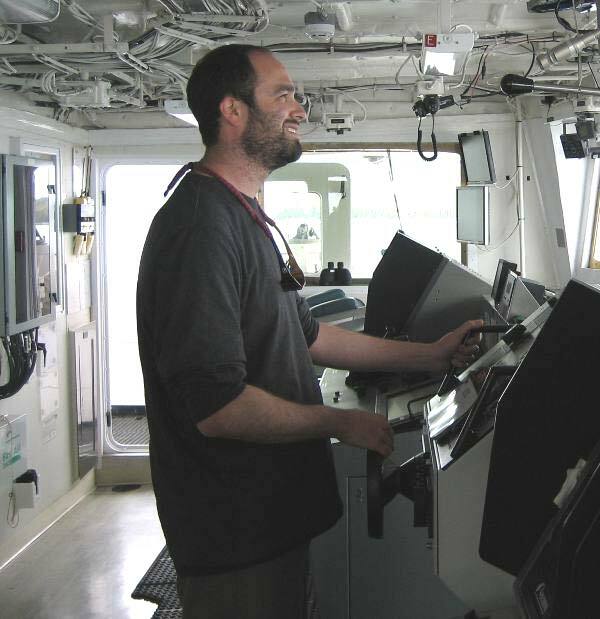 The ships personnel is divided between: NOAA Corps officers, survey, deck, engineers, stewards, electronics technician and visitors. There are almost 15 NOAA officers on the Fairweather, including the CO (commanding officer), XO (executive officer), FOO (field operations officer), and all the way thru captain lieutenant commander, 3rd mate, lieutenant, and ensigns. 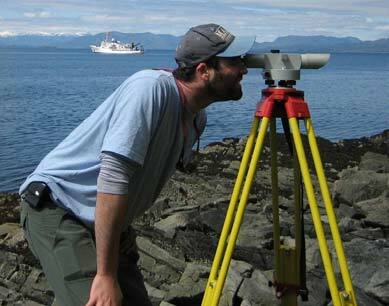 The survey group has approximately 10 people including the chief survey technician, senior, regular, and assistants. More of the Fairweather’s navigation systems. Digital readout of ship’s GPS (global positioning system) for precise latitude & longitude, speed in knots, and heading in degrees. The deck group has 12 people and they help to maintain the deck areas, drive the launch boats, and help out in the anchoring and docking processes. There are 10 engineers who make sure the ship is running properly. There are three stewards (cooks) who are amazing and make sure everyone is fed very well. 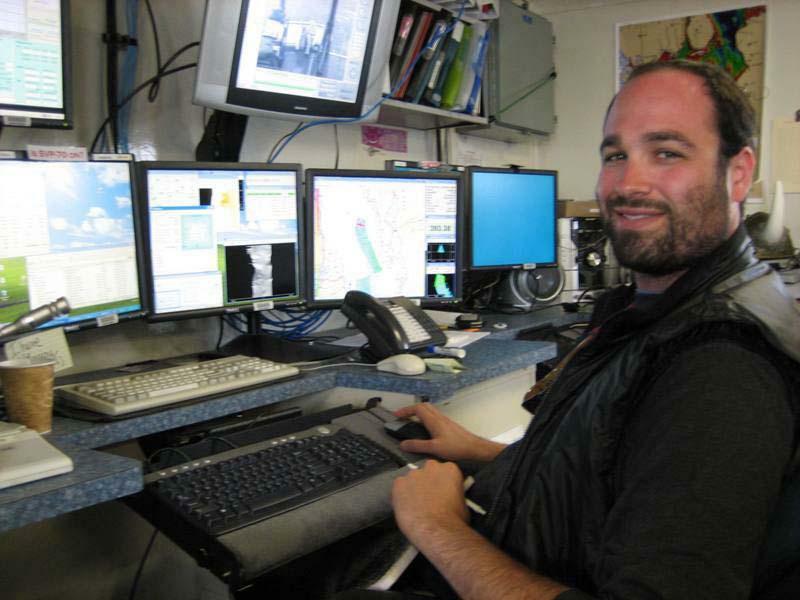 There are 2 electronics technicians, and anywhere from two to five visitors, such as teachers at sea, technology support, mission/NOAA related personnel. My stateroom on the Fairweather’s. 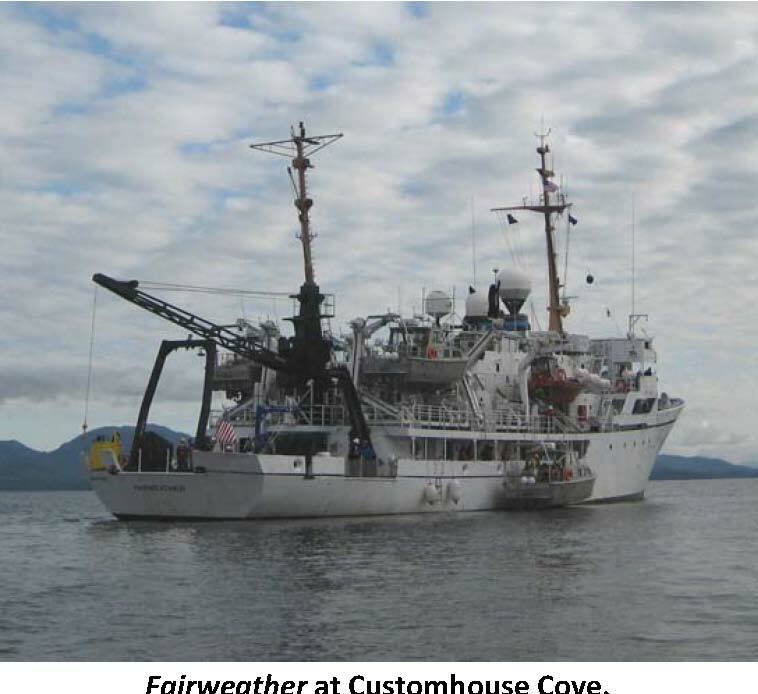 The Fairweather was originally commissioned in October 1968, deactivated in 1989 but a critical backlog of surveys for nautical charts in Alaska was a motivating factor to reactivate it in August 2004. 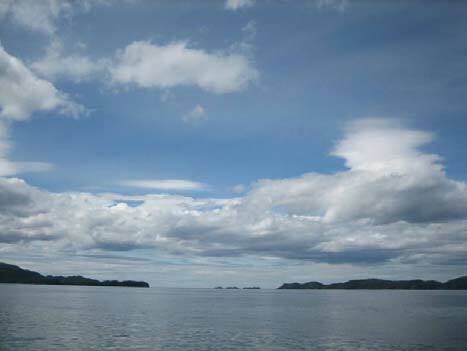 The home port for the Fairweather is Ketchikan, AK and it operates mostly in Alaskan coastal waters. 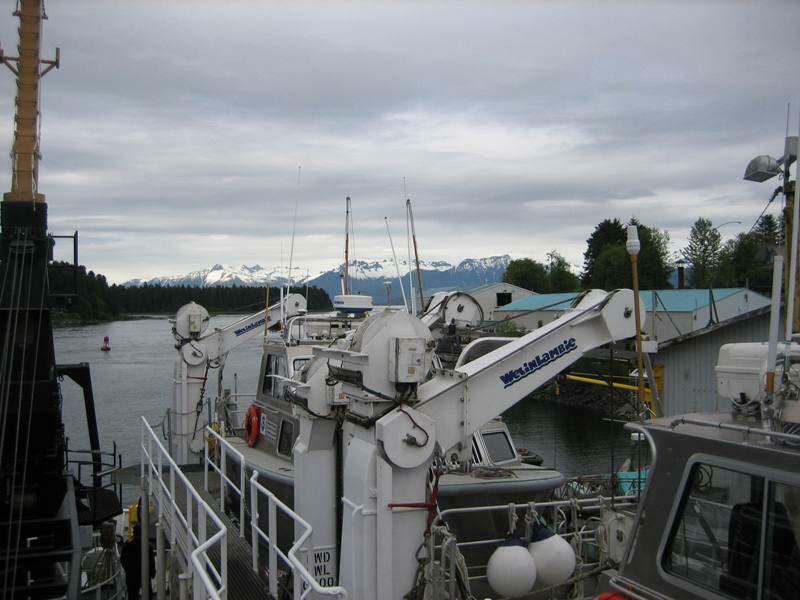 It is designed and outfitted primarily for conducting hydrographic surveys in support of nautical charting, but is capable of many other missions in support of NOAA programs. The ship is equipped with the latest in hydrographic survey technology – multi‐beam survey systems; high‐speed, high‐resolution side‐scan sonar; position and orientation systems, hydrographic survey launches, and an on‐board data‐processing server. It is 232 feet long, with a beam of 42 feet. It weighs 1,591 tons and the hull is made of welded steel. The Fairweather has a range of 6,000 autical miles, can stay at sea for 30 days, and has an average cruising speed of 12 knots. 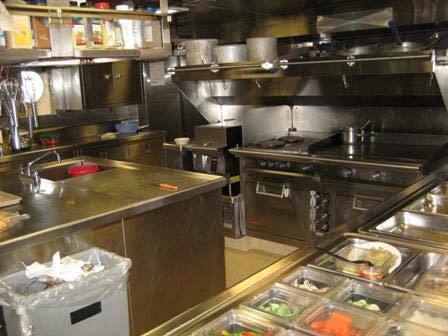 The galley (kitchen) on the Fairweather. 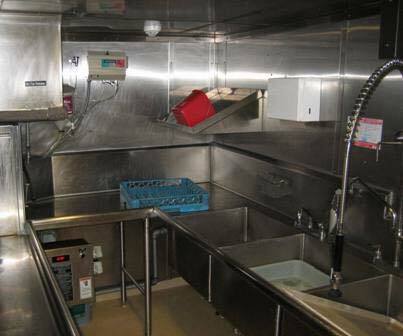 Dish washing station on the Fairweather. 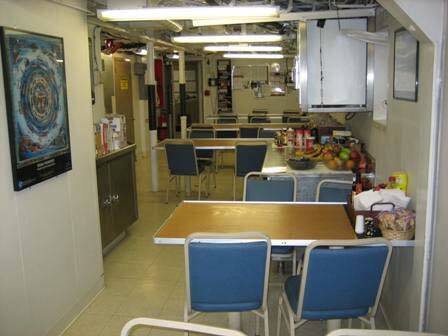 Mess hall (dining area) on the Fairweather. 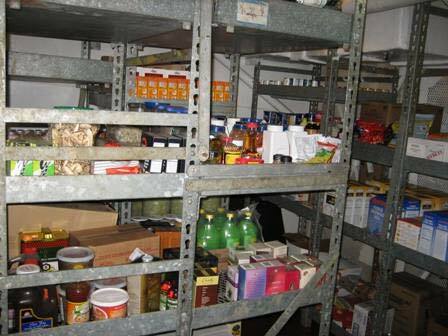 One of the food storage areas on the Fairweather. 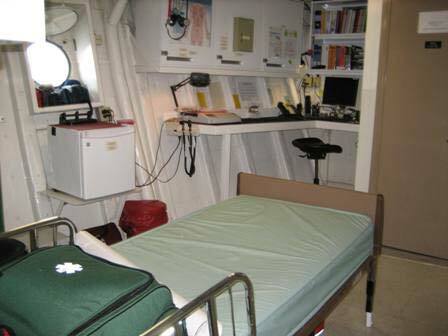 The staterooms on the Fairweather are fine for two people to live in. There is a bunk bed, dresser/desk area, closets, sink, small refrigerator, and a TV. 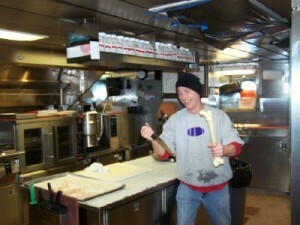 The food on the Fairweather is really good, not just for being at sea, but really good with a lot of different options. 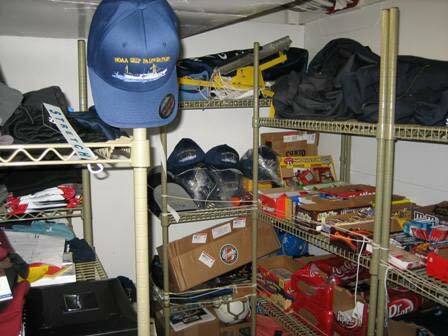 There is also a small store where you can buy candy, soda and clothing with logos and images of the ship. There is a small workout room that people do use to keep active. There are three different food storage areas, one for dry goods, a refrigerated area, and a freezer. 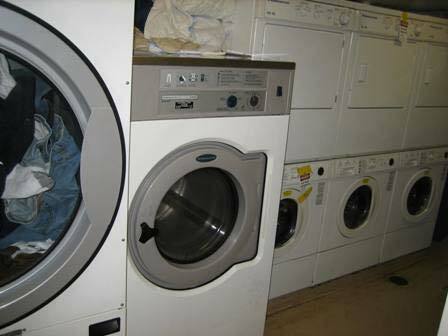 The Fairweather also has laundry facilities and a sick bay. Laundry room on the Fairweather. It is hard to believe that we are already heading south towards Seattle, WA. I have really enjoyed my time onboard the Fairweather and will never forget these experiences. Being a Teacher at Sea is amazing and I highly recommend it. I have seen so many different and new things that I can now add to my “teacher toolbox”. On Monday, being able to learn how to use the line throwing device was very cool, but that was not the highlight of my day. 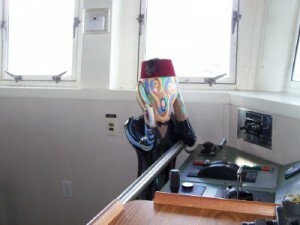 I was also given the opportunity to man the helm, and drive the Fairweather for about 10 minutes. It is amazing that a ship this big is so responsive to small changes in the angle of the rudders. It was sort of like driving a really big car, in the sense that when you turn the wheel right the ship goes right and turning left makes the ship go left. There is a lot to do when at the helm. You have to make sure that we are following the correct heading, going the proper speed, not heading towards any other vessels or obstructions such as logs or other debris, and in water that is deep enough for the ship. As much fun as it was it was a little nerve racking, my palms were definitely sweaty. 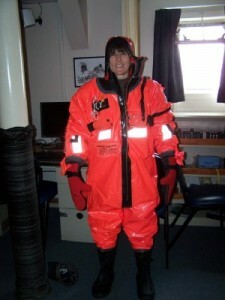 I did have the help of four other NOAA officers to assist me and help me know what to do. It is not only up to the person at the helm to make decisions about what to do or which course to follow. The Fairweather is definitely a place where the junior officers are being trained and learning what to do in all types of situations. This aspect of helping and learning was prevalent in many aspects of what I observed while onboard the Fairweather and was great to see. A while after I manned the helm, the seas got a little rougher as we went through Dixon entrance which marks the boundary between SE Alaska and British Columbia Canada. Here we were exposed to ocean swell from the Pacific Ocean/Gulf of Alaska. I was very glad this did not go on for too long. I made the mistake of trying to write this log while the ship was rocking and rolling a little bit. Not such a good idea. One of the officers told me to put down the computer, go out on the stern (back) of the ship, and look at land along the horizon. Being outside in the fresh air, while looking at land made me feel much better. The sick bay on the Fairweather. The rest of the trip towards Seattle has been very nice. The seas have not been too rough, and I am really enjoying the scenery as we go through the inside passage of British Columbia, Canada. Coming home and going back to New Rochelle High School will definitely be a change from the last two weeks. 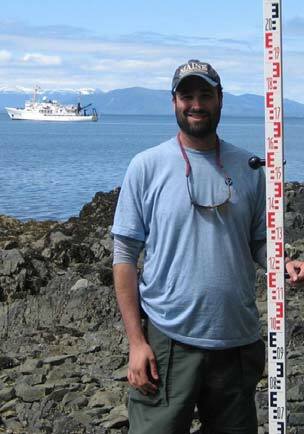 I will never forget the places, people and the science I have been exposed to in my time on the Fairweather in SE Alaska. We are now in the Puget Sound, and Seattle is almost in sight and I am ready to be home, back in New York. On Saturday, my watch began at 10:00 AM. Two of the scientists, Annette Dougherty and Kevin Bailey have watch from 4 AM until 4 PM. The other two scientists, Tiffany Vance and Steve Porter, have watch from 4 PM until 4 AM. I guess being the teacher they took pity on me and gave me half and half. Before getting to one of the stations, the scientists make sure that everything is ready. They lay out the bongo nets on the deck where they will be used. The bongo nets are two nets that from the top look like bongo drums. 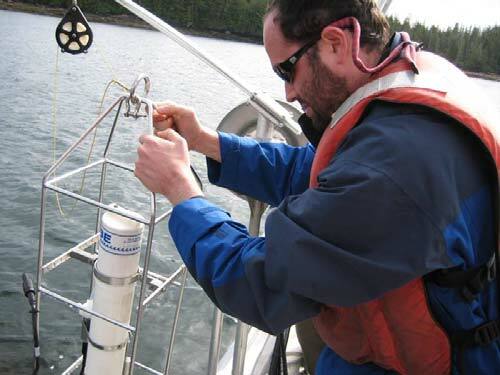 (See picture) There is an instrument attached to the bongo nets called a SEACAT that takes conductivity, temperature and salinity measurements during the tow. Inside the lab, buckets, bowls and tweezers are all laid out ready to be used. As we approach each station, the bridge informs the scientists and survey technicians. The bongo nets have already been readied and are set to be deployed (put into the ocean) from the hero platform. When the OK is given, the nets are lifted by the hydrowinch to a point where they can be maneuvered over the rail and then they are lowered into the water. The nets are lowered until they are at 100 meters or 10 meters off the bottom. As they are lowered, the pilot of the boat keeps the wire at a 45° angle by moving the boat slowly forward. Once the nets reach their maximum depth, they are slowly brought back up again. ( I tried to upload a video showing the deployment and retrieval of the bongo, but it won’t work so I’ll show you the video when I get back. When the nets clear the water, they are hosed down to get any organisms into the bottle on the end of the net (called the cod end.) The cod end is then removed and the contents of one net are poured into a bucket for sorting. The contents of the other net are preserved and sent to a lab in Poland where they use instruments to get a very accurate count of the Pollock. Inside the chem lab, the contents of the bucket are scooped out and poured little by little into a mixing bowl. We then perform a rough count by removing the very small Pollock larvae and any other fish larvae and put them into a petri dish with cold water (the petri dish is placed on top of ice.) They are only a few mm long (averaging between 6-10mm.) Once we have gone through the entire contents, the Pollock larvae are counted, photographed and the length measured. They are then placed into a labeled vial with 95% ethanol. 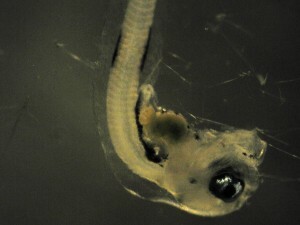 The other fish larvae are placed in a separate vial in 100% ethanol. They are kept in case another scientific team needs the data. The Pollock larvae will be sent to the scientists’ lab back in Seattle where they will perform further analysis on them. I’ll tell you more about that in the next blog. Annalise – The ship travels at 12 knots when we are going between stations. 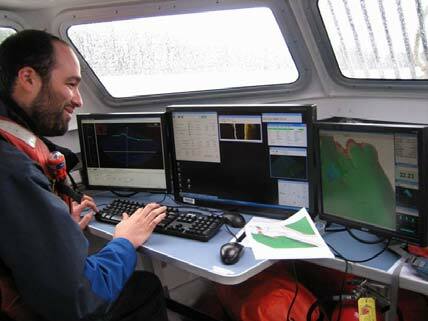 Dan – The Oscar Dyson observes and records a number of environmental conditions. The bridge takes weather readings every hour and keeps them in a weather log. These include wind direction, wind speed, seawater temperature, air temperature, air pressure, cloud cover, sea swell height and direction. Conditions in the water are also constantly monitored such as temperature, conductivity, salinity, and amount of oxygen. Olivia – The bongo tow is one way to get fish eggs. The mesh used on the bongo nets is very fine). It is able to filter out these very small larval fish and fish eggs, too. Brittany – There is no specific number of fish that need to be caught for this experiment. Part of the experiment is to see how many larval fish there are. For our rough count, the scientists measure 20 larvae to get an estimate of their size. They will then look at the otoliths (small inner ear bones) to estimate their age. Amy – Aside from the Pollock larvae in the nets, we have caught cod larvae, larval squid, fish eggs, amphipods, terapods, jellies, Euphausids or krill, copepods and the larvae of other fish. The nets are small enough that we don’t catch any large fish or other animals. Josh W. and Jon – Joel Kellogg has the night shift, so I haven’t met him yet. Stephen Macri is not on this cruise so I can’t ask him your questions. In your answers to the last blog, many of you researched the large animals that live here in the Gulf of Alaska. The most abundant organisms, however, are much smaller. 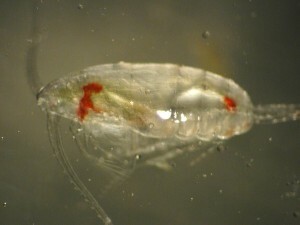 Two organisms that are very important to the survival of the large animals here are copepods and Euphausids. 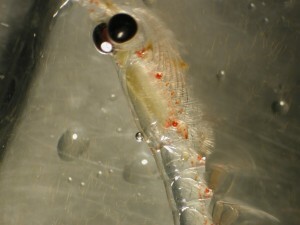 The larval Pollock feed on the larval copepods that are called copepodites. Again, Please be sure to include the link to the website where you got your information. Answer the questions in your own words writing complete sentences with as much detail as you can. I spent the morning on the smallest and most maneuverable of the launch boats on the Fairweather called an Ambar. Unlike the other launch boats that I was previously on, this one does not have a sheltered area so full cold weather/rain gear was needed. 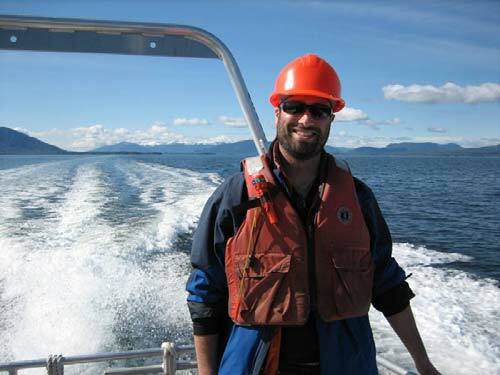 Our task was to collect sediment samples from the bottom of Shoalwater Pass and Princess Bay. We were the first of four launches to go out on this day. As we were being lowered down from the ship everybody started to notice porpoises all around us. Me getting ready to lower the bottom sampler to determines edimentsizes of the channel floor. 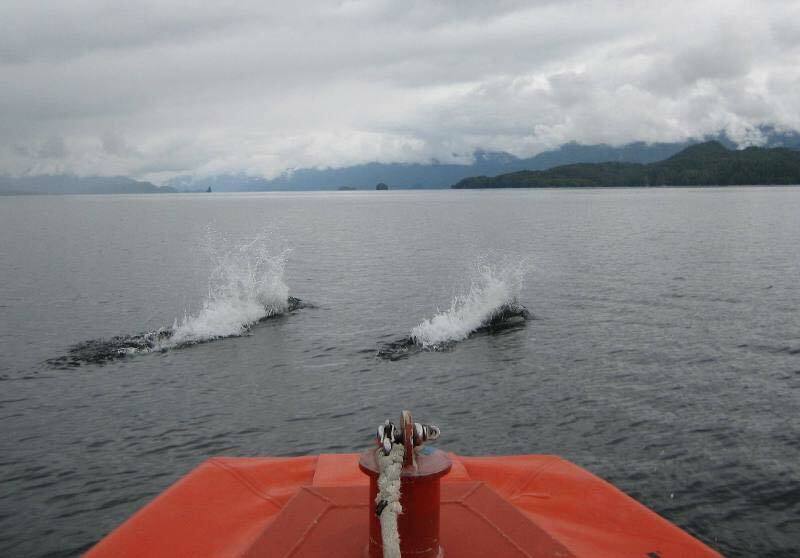 Once the Ambar was deployed the porpoises began racing alongside the boat. They stayed with us for a few minutes.It was an awesome sight and an experience that I will never forget. Later, at lunch I was talking with the CO (commanding officer) and he told me that he had never quite seen so many porpoises ride alongside a launch boat for such a long time. What I saw were Dall’s porpoises (Phocoenoides dalli)a species that is only found in the North Pacific; from the Bering Sea and the Gulf of Alaska (spring to summer) and in coastal waters as far south as Baja California (fall to winter). Their unique body shape makes them easy to distinguish from other porpoise species. They have a very thick body and a small head. Their coloration is much like an Orca (killer whale), with their bodies being black with white patches on their underside. Dall’s Porpoises are hugely active and playful creatures. They will often zigzag around at great speed on or just below the surface of the water creating a spray called a “rooster tail”. They often appear and disappear quite suddenly. They will approach boats and ride alongside, but may lose interest, unless the boat is travelling quickly. 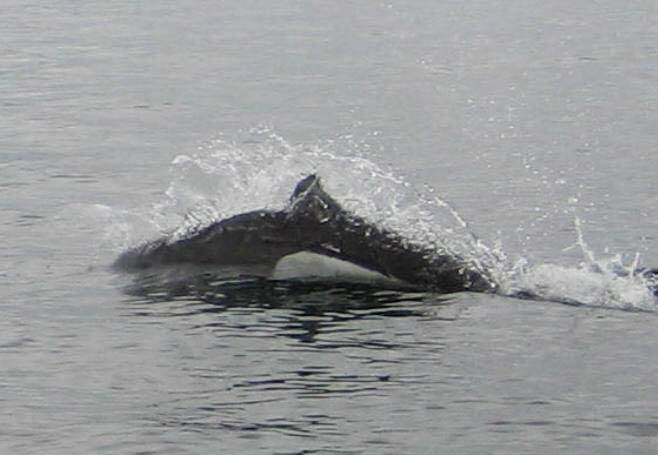 Here is one of the Dall’s Porpoises surfacing for air. Dall’s are usually larger than other species of porpoises, growing up to 2 or 3 meters in length and weighing between 280 to 450 lbs. This species of porpoise can live as long as 15 to 20 years. They feed mostly on squid and a variety of fish. They are the fastest of all porpoises; they can swim at or up to 35 miles per hour. They often appear in small groups. Today, I would say there were at least 15 to 20 of them, but they were so fast and difficult to count. 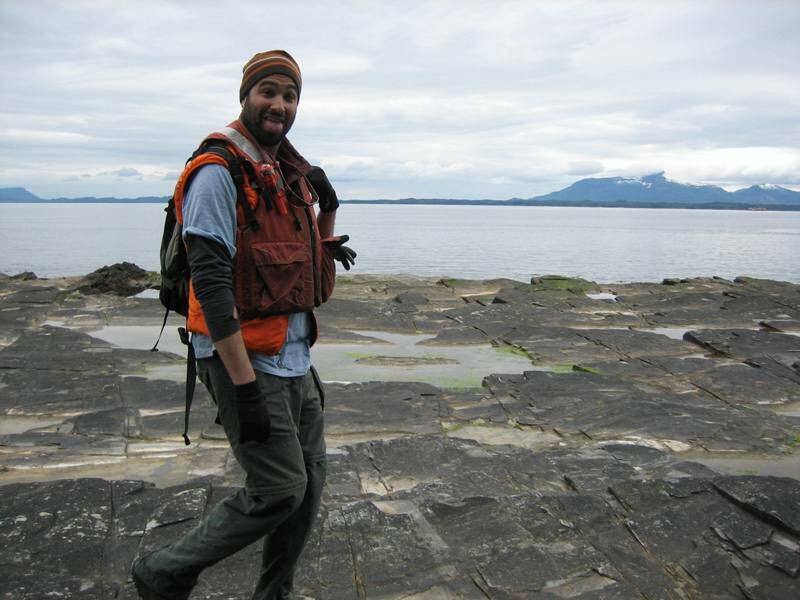 After the excitement, we drove over to Shoalwater Pass and began collecting our first of eight bottom samples. The information gathered from these samples is very helpful to ships that might be anchoring in a particular area. For example, if you anchor in deep mud, the anchor could become trapped or stuck in the mud, or if the bottom is very rocky the anchor would not be able to set into the bottom at all. 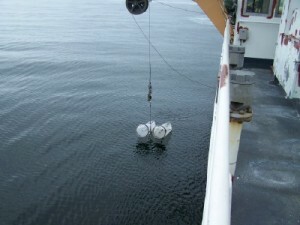 In order to collect the bottom sediments we had to lower down a heavy sampler and allow it to hit the bottom. In deeper water this was definitely more difficult. 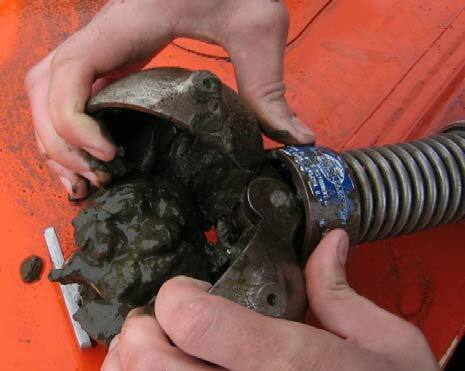 As you can see, we had to pull the sampler up by hand and hope that it had closed and collected sediments. It did not close every time we lowered it, so some of the site required more than one drop which made the task even harder. Here I am pulling up the bottom sampler.Not as easy as it looks. soft, stiff, volcanic, calcareous, hard, soft, light, dark, small, medium, and large. Here is one of the bottom samples that we collected. 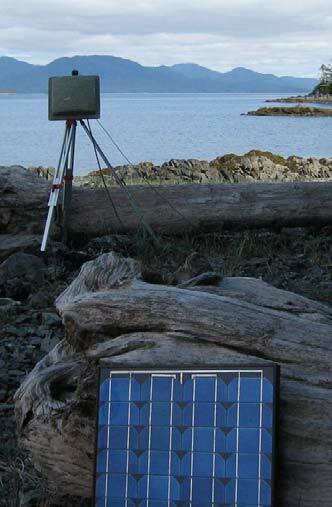 After each sample was taken we used a laptop (that can get wet) with a GPS receiver attached to it to log our exact positions. This information will be part of the charts that will be made when the area is completely surveyed. 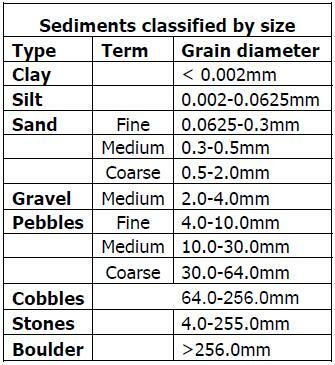 Chart of sediment size ranges. Tough notebook laptop,yes it can get wet. As already stated one of the highlights of my trip so far has been the Dall’s porpoises that raced alongside us. That is something that I will never forget. This was not the only wildlife sighting of the day. When we were transiting from one sample area to another, I spotted a bald eagle and pointed it out to two of the other guys on my boat. What happened next was awesome. Once we saw the eagle, which as I have told you are all over the place, we noticed another smaller bird in front of it. The eagle was chasing him and was hot on his tail. Suddenly the smaller bird had nowhere to go and did a nosedive into the water. This was so cool. 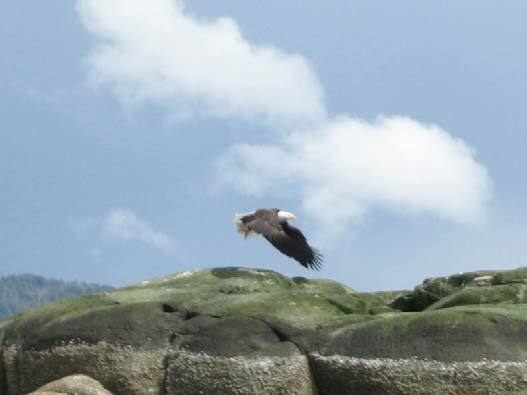 Then the eagle proceeded to circle the smaller bird from above so as to say stay down there. I also saw numerous whale spouts from a distance, too far to tell what type. While back on the Fairweather for lunch a stellar sea lion was swimming right along the starboard side of the ship. When I went outside to see him, he surfaced, came out of the water about chest high looked right at me and swam away, never to be seen again. 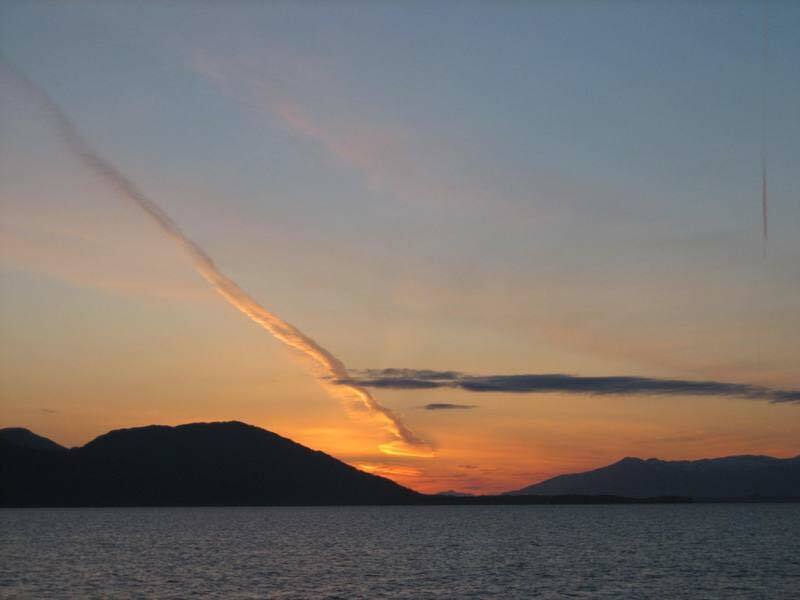 SE Alaska is truly a special and magical place. Not just for wildlife, the scenery is absolutely spectacular. I can’t wait to see what another day brings with it. On Wednesday, May 19, I was able to go out on a small boat launch. Four such boats were deployed from the Fairweather that morning. 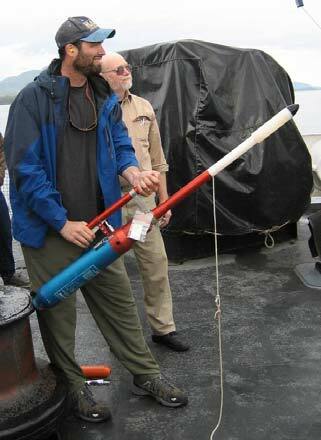 They all use 400 kilohertz multi‐beam sonar to map the bottom of the channels we are currently in, near Ketchikan, AK. This type of SONAR sends out 512 beams/ping of sound, and is most effective in shallow water. The area or swath that can be scanned at anytime is about 5 times the depth of the water. Therefore in shallow water the swath is much narrower and in deeper water the swath is much wider. Most of the work today on all of the launches was filling in small areas in the chart in which data was missing or not dense enough to complete the project. These areas are referred to as “holidays”, because they are areas where previous survey launches have been through the area and the data was not good enough. Some possible reasons for this could be that they are areas where acoustic noise was picked up by the multi‐beam SONAR, or where shadows were cast from the surface bedrock or boulders on the bottom of the channels. 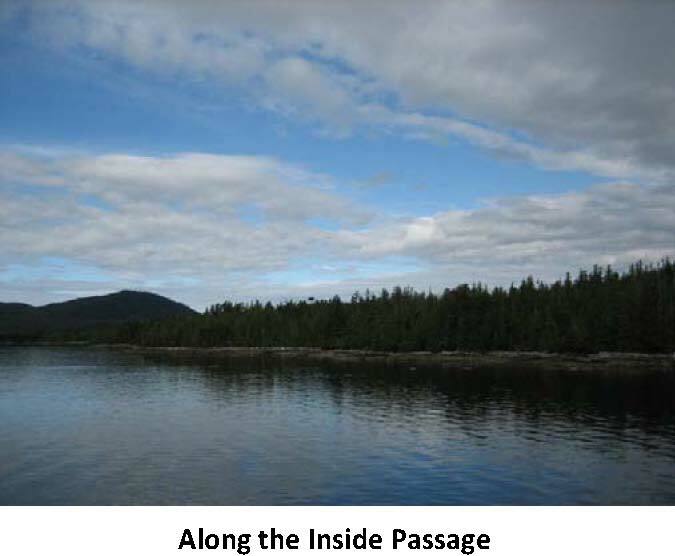 The area that we surveyed first is called Cascade Inlet. 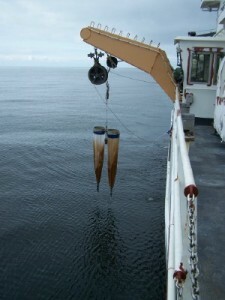 Not only did I get to use the computers on board to operate the SONAR and collect data, I was also able to deploy an instrument called a CTD that measures the conductivity, temperature and density of the water. This is very important because the speed of sound in water changes depending on the waters temperature density and conductivity. For example, the top layer of the water is typically a little warmer, less dense and less salty than deeper water due to influences from rain and inputs from rivers. 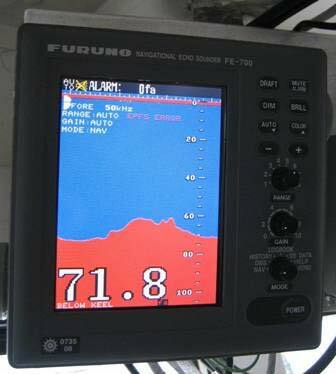 When using SONAR you must know all of these factors in order to understand the speed at which sound waves will travel through the water. The sound waves will travel faster in cold deeper water, and the computer models take this into account before finalizing a chart. 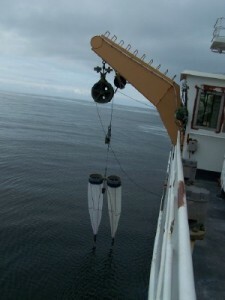 Ideally when using the CTD the sample must be taken at a depth that is greater than any spot you have surveyed so as to have a complete profile of these factors. 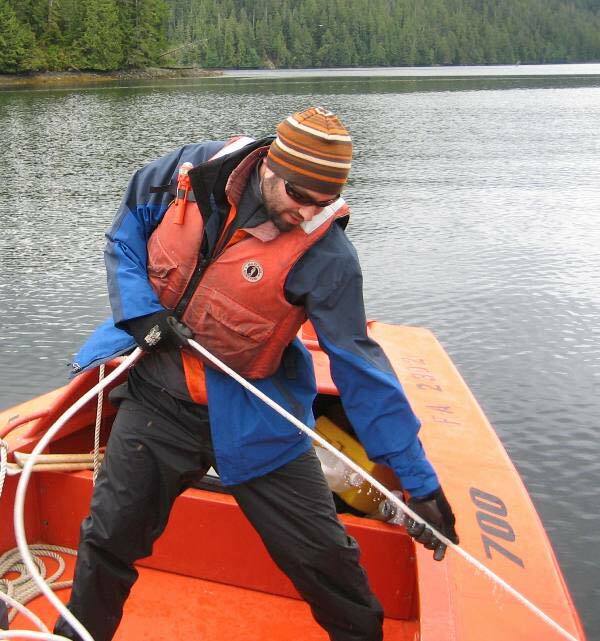 Me on a small boat (launch) pulling the CTD sampler back onto the boat. In the afternoon we spent most of our time performing shoreline verification of small features around an area called Hog Rocks that have been previously identified. Here we used GPS (Global Positions Satellites), latitude and longitude, azimuth bearings, elevation and photos. As the name implies we were visiting small features to double check their exact location and exact heights. On Thursday, May 20 I was scheduled to go out on a launch boat again but things did not go accordingly. There was a problem with the Davit, a mechanical crane that picks the 7 ton, 28 foot survey launch off the decks of the Fairweather and deploys them into the water. Since I was unable to go out and scan shallow water from the launch, I stayed on the Fairweather to scan and plot deeper water (approximately 400 meters) in and around Behm Canal. 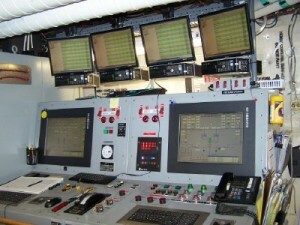 From the plot room of the ship I helped operate the computer, by starting and stopping the collection of data. In addition to filling in “holidays” we also mapped some cross lines. Cross lines are lines that run perpendicular to the main channel and are a means of verifying previous scans or quality control. Me, in the plot room on the Fairweather, collecting data. I can’t say that the launch on May 19 was fun, but it was very cool and interesting. One thing no one told me was that after the morning rain was over that the sun would come out and it would reach almost 60 degrees, and that I should have brought sunscreen and a hat: warmer than it was in NY on this day. I now know for future launch days. I am usually going to be scheduled on a different launch team, doing slightly different tasks each day. For now I just finished dinner, and yes it was very good again. In the meantime I am awaiting a debriefing of the day’s launches, and then hang out until bed. 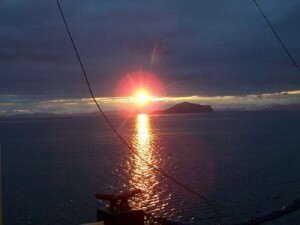 Before going to bed I went up to the highest deck on the Fairweather, called the flying bridge and watched one of the most beautiful sunsets unfold in front of my eyes. 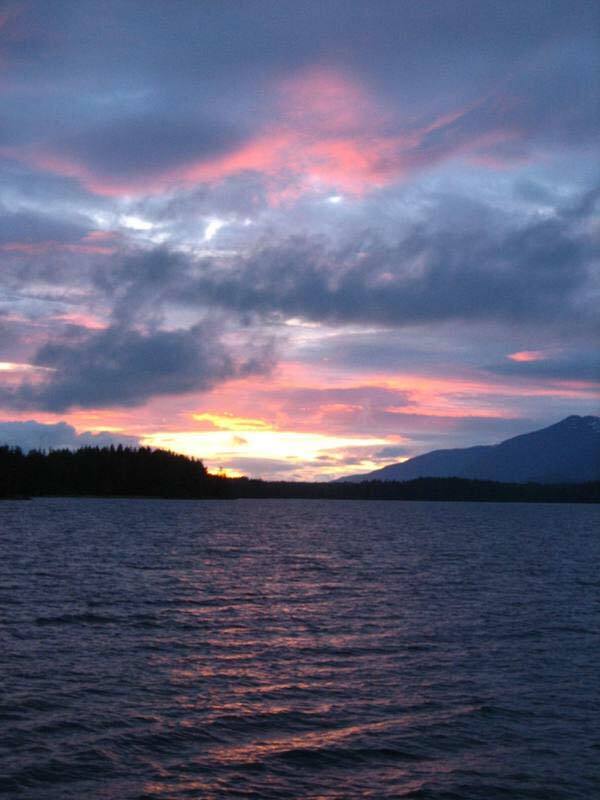 What else, is on my mind…..Well SE Alaska is ridiculously beautiful, this coming from someone who has traveled a lot and used to work in the Grand Canyon. All over the place there is something new to see. I am still waiting for major whale sightings. Tuesday night before bed I caught a glimpse of some tails of a few porpoises (similar to dolphins), and Wednesday morning at the safety meeting on the stern of the boat (back) I sort of saw a whale surface for a moment. 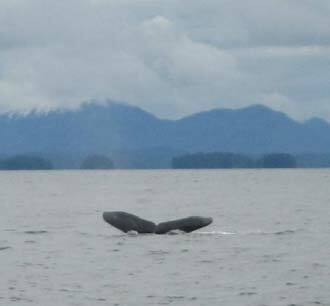 On Thursday, again at the safety meeting on the stern, a few of us saw a humpback whale at a distance breach the water a few times.